I feel like I often hear my friends and other people my age (thirtysomethings) talk about wanting to disconnect. “I just want to delete my Facebook…but it makes it so easy to keep in touch.” “I just need to take a little social media break.” Instagram, Facebook, Twitter, Snapchat, it’s all become so ever-present in our life that it can begin to take over. That’s not shocking news. But I think it is a little shocking how hard it can be to really take that break or delete an app. Despite growing up as kids without cellphones, let alone smart phones, we’ve become adults who are hopelessly tethered to our devices and our virtual connections to the people and world around us. I have personally had the same struggles. I can’t tell you how many times I’ve defiantly deleted the Facebook app off my phone and then found myself “sneaking” onto the mobile page to do nothing but waste time. Sometimes when I’m taking a break I find myself frustrated with my phone as if it’s a living thing, cursing it for having nothing for me to browse like a child whose parent did not bring anything to do on a long road trip. It’s a strange, first world, 21st century struggle. Shouldn’t it be easier to do something you want to do? Last month my husband and I took our first trip out to California. 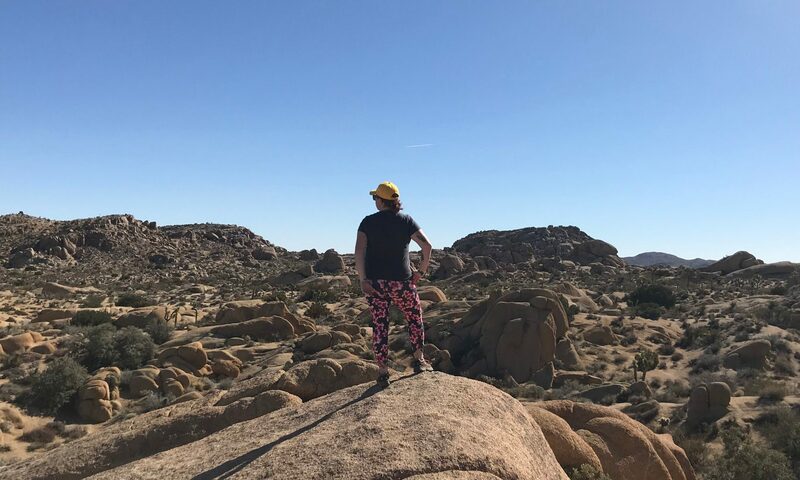 The two major things we did were pretty much polar opposites – Disneyland and Joshua Tree National Park. We adored Disney but for me, the most remarkable, let’s do it again thing we did was spend an entire day driving through Joshua Tree. There was zero service almost immediately and it was, to be completely cliché for a moment, a tremendously freeing experience to be on a road surrounded by nature with no one to connect with but my husband. At times we didn’t even bother trying to find an FM radio station to listen to and drove in complete quiet except our conversation. We experienced so much within the 70+ mile trip. We hiked, climbed rocks, saw the Coachella Valley from 5000 feet in the cold and very windy air. We walked through a garden composed completely of cacti. While I initially felt myself feeling withdrawal regarding my social media – feeling disappointed I couldn’t post something to my Insta Story as it was happening for example -or thinking crazier things like, “by the time I have service, it’ll be late on the east coast and no one will like my photo,” the whole lack of internet thing eventually drifted away. We were in awe of seeing SO MUCH open space and so much varied terrain in one place. We were humbled by the immensity of it all and found ourselves talking about the importance of preserving wide open natural spaces as we basked in the grandness and majesty of it all. Being back to basics as it were; together with someone you care about with no distractions to speak of, was an experience I’m very grateful for. It gave us no choice but to evaluate our surroundings, our present, and our lives in general a bit. It’s something that I’ve thought about a lot since when I’ve been overwhelmed with stress or anxiety – that feeling of vastness and the sensation that you could just disappear into the horizon if you wanted. It’s hard to mimic that feeling exactly in suburbia. But I would suggest that beyond just taking that break from the technological world, that quiet is highly underrated and often forgotten. I’m not necessarily suggesting that you meditate – though that’s something that a lot of people benefit from – but something more like evaluating a need to fill every moment with sound. When I’m doing anything from driving to working out to cooking dinner I have a podcast or music playing. I want to keep reminding myself that sometimes it’s ok to complete tasks or tackle the everyday without aural companion. We’re constantly stimulated, consistently distracted, and training ourselves to absorb life in short bursts instead of a long road. Our lives often exist at a break neck, what’s next pace. I’m looking to incorporate a little more Joshua Tree state of mind. Previous PostPrevious Grief. Grieving. Grieved.